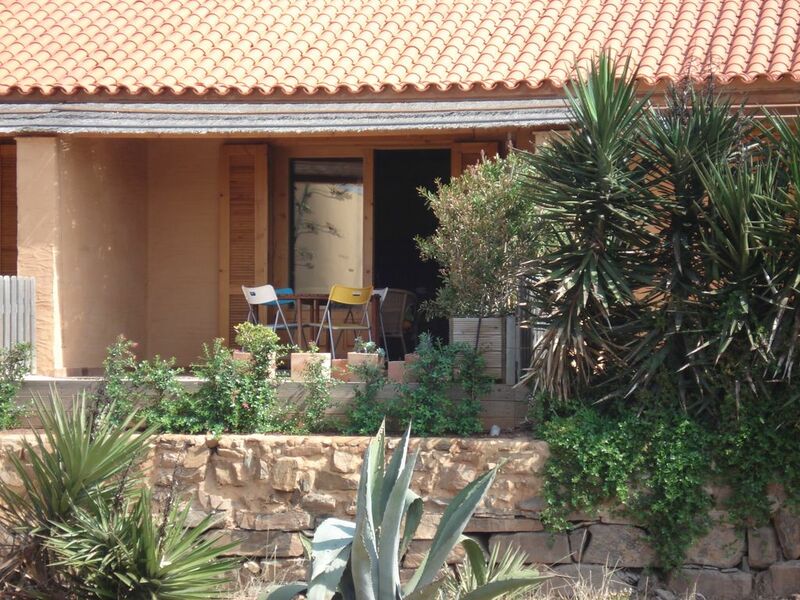 Surrounded by sand dunes and iconic cactus trees, ideally located less than 1 km from the center of Carrapateira village and within a stone's throw of the astonishingly beautiful Bordeira Beach , the house is perfectly positioned to enjoy the unique beauty of the Vincentinian Coast. Built from environmental friendly materials, using traditional adobe bricks, the house comprises a large open plan living and dining space with kitchen, a spacious double bedroom on a mezzanine level (16 m2) and a high spec bathroom. The kitchen comes fully equipped and the whole is tastefully decorated. To the rear of the house is a well maintained terrace (16 m2) with a beautiful view of the sand dunes and the Natural Park. The house is at the far end of a small private condominium, set away from the road and any noise. It is the ideal choice for those looking for romance, the perfect surfing spot, to explore the Rota Vicentina (whether by foot, bike or on horseback), or simply to relax and enjoy the beaches and the beauty of nature. The best fish and regional food restaurant (Restaurante Sítio do Rio) is only 2 minute walk from the cottage. Less than 1 km, on the way to Praia da Amado, is another excellent fish restaurant (Restaurante Sítio do Forno) with a suberb view over the sea. The best pizzas in the region (Pizza Pazza) are in Aldeia da Pedralva, less than 10 km on the way to Vila do Bispo. Still in Aldeia da Pedralva, is the restaurant/bar Sítio da Pedralva, which we also recommend. A variety of very good restaurants and bars are available within 25 km. For those passionate about surfing, surfing boards and neoprene suits can be hired at the town center or Praia do Amado, 3 kms away from the cottage. For those looking to take on surfing lessons, these are available both in Praia da Bordeira (5 min walk) and in Praia do Amado. If you enjoy going for long walks, cycling or horse riding there are numerous coastal and inland trails to use. At the center of the village you can find minimarket “Irene” where you can buy the essentials, including bread. Other supermarkets such as Lidl and Intermarché within 25 km distance. This house is the one but last of the row of houses on a small private condominium, which gives it quite a privileged position, away from the noise and the main road. It comprises a large living space with a lovely dining area and a well equipped kitchen. In the living area there is a couch with a single bed underneath, very handy for a small family of three people. The single bed can be pulled out for the evening and slide back underneath the couch in the morning, leaving the area nice and tidy for the day. Upstairs in the mezzanine there is a good size double bedroom with a comfortable king size bed (1,80 X 2,0 m). Downstairs there is a bathroom with window and a large shower base with glass doors. From the well maintained west facing terrace the visitor can enjoy a lovely view of the sand dunes and the Natural Park. The perfect place from which to enjoy a beautiful sunset! There is a bathroom with a window and a large shower base with glass doors. large living space with a lovely dining area and a well equipped kitchen. We loved the house, the place and the location. The house is fantastic, very rustic and cosy! It´s very near of bordeira beach (5 min walk), a very beautiful and long beach great for surfing. And side by side with the best restaurant in carrapateira. Excelente place to relax, surf and eat well! I recommend it for sure! Leider ging von Anfang an das Internet nicht.Trotz Kontakt mit dem Vermieter hat sich die ganze Woche nichts daran geändert.Wir waren Anfang März da ist es schon noch kühl und es gab nur einen Mini Heizkörper.Die Lage ist Traumhaft schöner geht nicht. Indeed the internet wifi router broke, and we replace it as soon as we found out (initially we thought it was a problem from the service provider), we are sorry for that, we try to have everything working perfectly for our guests, unfortunately is not always possible to fix immediately all the problems. The house is easy to warm up, we don't have complaints about being cold inside the house, but this winter has been unusually colder. The guests that were at the house after you, and just checked out, were very happy and no complaints about being cold , but we will have in consideration your suggestion and be aware if something else is needed to keep the house always comfortable. Gite très propre, bien équipé et accueillant. Un peu frais en hiver ?? Des paysages magnifiques,y compris l'arrière pays. On peut éviter l'est de Lagos (béton), mais entre Lagos et Odeiceixe, super. gleich gegenüber kann man sehr gut u. preiswert essen. Hier spürt man den Atlantik mit hohen Wellen, ideal für Wellenreiter, Surfer und Kiter. Relaxtes Urlaubsende in Carrapataira. Das Haus liegt in Laufweite zum Bordeira Strand, zum Surfen sollte man aber besser zum Amado Strand fahren, weniger Wind bessere Wellen. Die Kommunikation mit Gonzalo war super. Man findet im Haus alles was man braucht bis auf eine Wasch/Spülmaschine(haben wir für die kurze Zeit auch nicht gebraucht). Wir waren zu viert. Optimal is die Unterkunft aber wohl für Paare oder mit einem Kind. Alles in allem schönes kleines Reihenhaus das auch bei heißen Temperaturen angenehm kühl bleibt. Coming from Faro Airport by car, follow signs to A22 (Via do Infante direction to Lagos/Portimão. After +/- 100 km (end of A22) follow direction to Aljezur/Sines. About 5,5 km turn left towards Alfambras/Sagres/Vila do Bispo. Carrapateira is the first village after Bordeira. Coming from Lisbon, follow signs to A2 SUL direction Algarve. At the end of the motorway take A22 direction Lagos/Portimão and follow the same route as above.